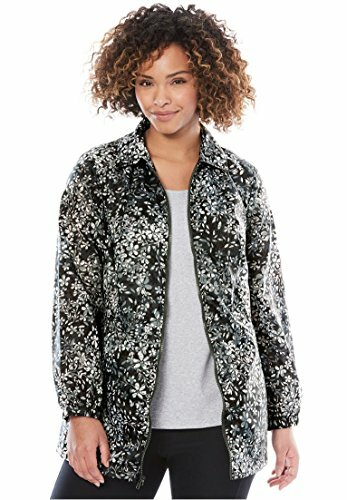 This plus size zip-front nylon jacket is a spring basic that should be in every woman's closet, no matter your body type. It is lightweight, wind resistant yet still comfortable and breathable. classic silhouette gives plenty of room to move, smooth nylon taffeta is wind resistant your favorite length for coverage; 30" easy on, easy off full zip front front seams provide a better, more comfortable fit elastic cuffs stay put, keep elements out handy pocket washable nylon, imported layer over a sweater wear over jeans Women's coat in sizes M(14W-16W), L(18W-20W), 1X(22W-24W), 2X(26W-28W), 3X(30W-32W), 4X(34W-36W), 5X(38W-40W)The Comfort FactorThe front seams add shape and structure, forming a fit that is more comfortable. The slight A-line flares gently to a length gives you freedom of movement. The lightweight nylon fabric creates a great first layerand packs small for trips. What Customers LoveOur customers love our lightweight jackets. They find them to be perfect over casual looks, in colors that mix with everything in their wardrobe. If you have any questions about this product by Woman Within, contact us by completing and submitting the form below. If you are looking for a specif part number, please include it with your message.